The model is 1,67m tall and wears size S.
YAKUZA BUTTERFLY women's bomber jacket. Baseball style in this bomber jacket, featuring ribbed collar, cuffs and hem, a front zip fastening and two front pockets. 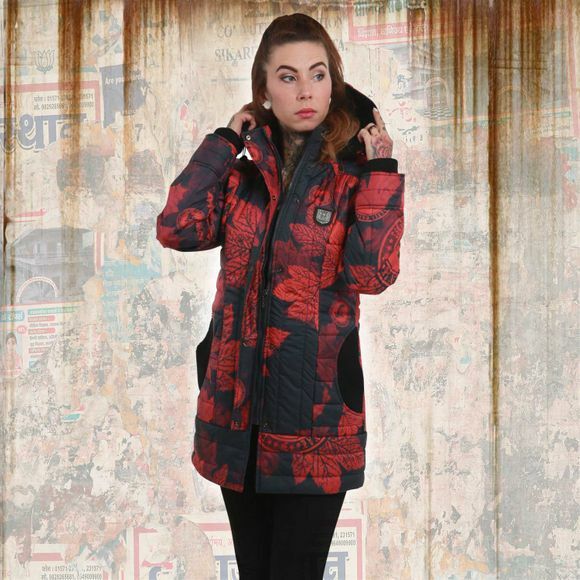 The jacket has a contrasting design on the collar, cuffs and hem and an allover print design. The Butterfly bomber jacket is finished with a Yakuza leather tab on side seam. Watch out for our size specifications and the washing instructions below.